Nobody can seem to decide whether a Tengu 天狗 is a god or a beast. They occupy that large, nebulous, grey zone between the divine and the horrific. Which in my eyes puts them on pretty much the same level as humans. I like, and strongly respond to, that ambiguousness. A person never really knows where one stands with a Tengu. Maybe they’ll help you find the path down the mountain. Maybe that path is actually a straight drop off a cliff in the dark. Maybe they’ll stand guard and protect the mountain and its denizens from fire or threat. Maybe they’ll start a war. It’s all pretty much up-in-the-air with a Tengu. These days, Tengu are usually depicted as red-faced, long-nosed bearded men. I’m more partial to the primal creature, with it’s raven’s beak and claws. If you go back far enough, the Tengu were even more inhuman, just a twisted mass of feathers, beak, talons, and google eyes. 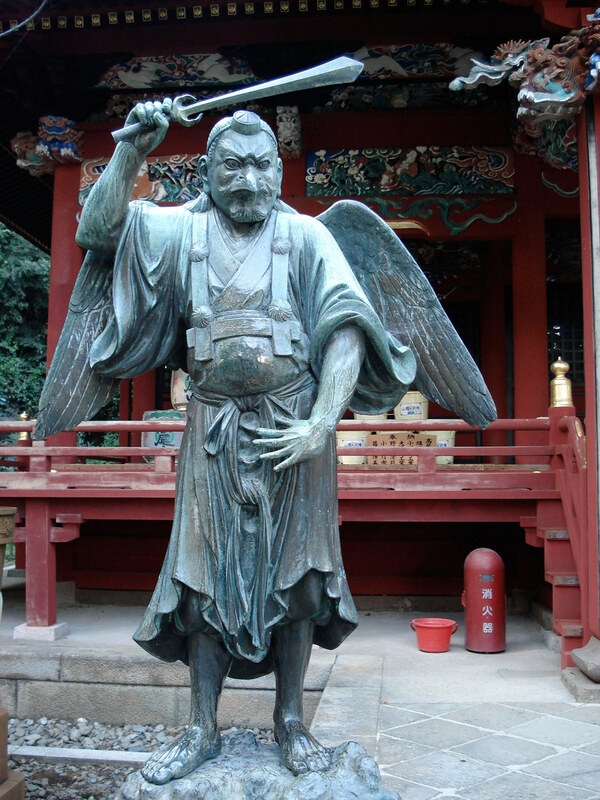 Japanese mythology is full of shape-shifting transmogrification, so it makes sense that the Tengu should partake of that particular power pool. While this yokai is typical drawn as a kite (the bird of prey, not the toy on a string), I opted to borrow from the birds I see more in my everyday life here - the raven. Along with that choice comes generations of metaphor and symbolism - trickster and creator, messenger of both good and ill omen, carrion eater and prophet. They straddle that line between the worlds of the living and the dead - which makes them absolutely appropriate for a creature that can’t decide if it’s it a god or a monster. Of all the accoutrement Tengu have been known to haul around, I liked the ha-uchiwa 羽団扇 best. With this feathery fan, the Tengu has been known to whip up massive winds and storms. Visually, that’s a whole lot of fun to draw. For me, the wind has always been a symbol of change, or a harbinger of impending renewal. It cuts through stone and wears down mountains. It forecasts a turn in the weather; bringing in the storm or dispersing the dark clouds.